James Monk, on right, speaks May 31 at the Chester Library. Tavorise Marks is in the center. 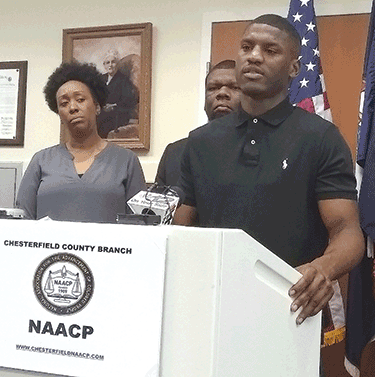 Misdemeanor obstruction of justice and illegal window tint charges were recently withdrawn for the second time against a 23-year-old Richmond man who was Tased by Chesterfield police last year. James Edward Monk was initially charged following an incident at 12:30 a.m. March 28 near Virginia State University. The charges were originally withdrawn Aug. 22, refiled Oct. 10 and withdrawn again Dec. 17. Monk was pepper sprayed twice and Tased once after failing to comply with police officers’ orders during the incident, which lasted three minutes and 11 seconds. Chesterfield police Capt. Randy Horowitz said that the use of a Taser in the incident was not in accord with department policy because no one was in danger. Four Chesterfield police officers who were on scene at the time the Taser was deployed were retrained on the use of a Taser, police department spokeswoman Liz Caroon said. Two of the officers were disciplined as a result of an internal investigation. Last week, Chesterfield Commonwealth’s Attorney Scott Miles said he made the decision to withdraw the charges the second time. Miles said he viewed seven body cameras worn by those who were on the scene and spoke with the two officers most involved in the arrest. “Ultimately, I determined that, even if we were able to obtain a conviction in this case, I wouldn’t be able to justify our decision to go forward to the larger community that we serve,” Miles said in an email. “Reasonable people often disagree about the most appropriate way to handle a particular case, and I respect that there are thoughtful people with differing views of how this one should have been resolved,” Miles said. 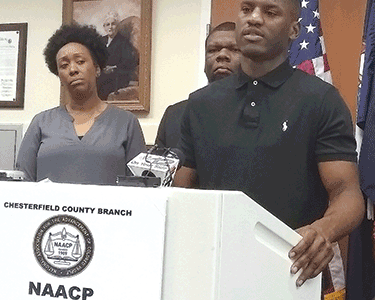 Tavorise Marks, chairman of the Chesterfield NAACP’s Legal Redress Committee, held a press conference May 31 at the Chester Library where he, Monk and others protested Monk’s treatment during the Tasing incident. Marks has filed campaign paperwork to run for the Democratic Party nomination for the state House in District 62, which is currently represented by Del. Riley Ingram, R-Hopewell. Ingram is retiring after this year. Chesterfield school board member Carrie Coyner has filed paperwork to run for the Republican nomination.